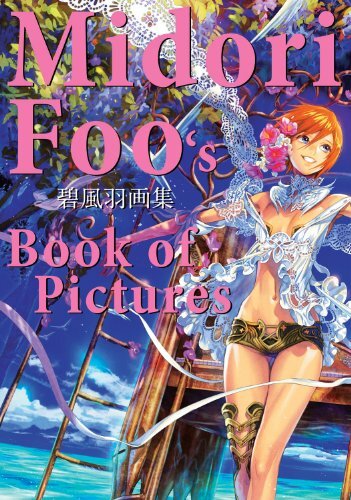 Midori Foo's Book of Pictures is an impressive 320-page artbook of character art from Japanese artist Midori Foo. It was originally published in Japan as 碧風羽画集 in 2011. This is the edition translated by Udon for the English readers. There really isn't any text except for the index of works at the back of the book. Speaking of the index, I don't know why they have it in the format where you have to flip the book 90 degrees anti clockwise, and the index does not come with pictures so you have to flip to the appropriate page to check out the artworks -- other Japanese artbooks have art thumbnails to go with the index. Not a big issue anyway. This is in essence a character design book. Obviously the style is very Japanese so there's a strong dose of eastern oriental element to the costume designs. There are some very detailed costumes. Many you can tell are designed for video games. I suppose those characters without backgrounds are for video games. The rest are filled with elaborate beautiful backgrounds. Midori Foo has created art for Square Enix, Bandai Namco, Konami, SEGA and other companies. Other than the warrior type, fighting game character illustrations, there are also the more flowery pieces, with the softer more feminine tones. Overall, the artworks are very colourful from the myriad use of colours. Most are female characters. 320 pages is a lot and the illustrations are printed at full page sizes with a handful at slightly smaller sizes. So this artbook is quite worth the money in that sense especially if you like Japanese character art with a preference to manga style.